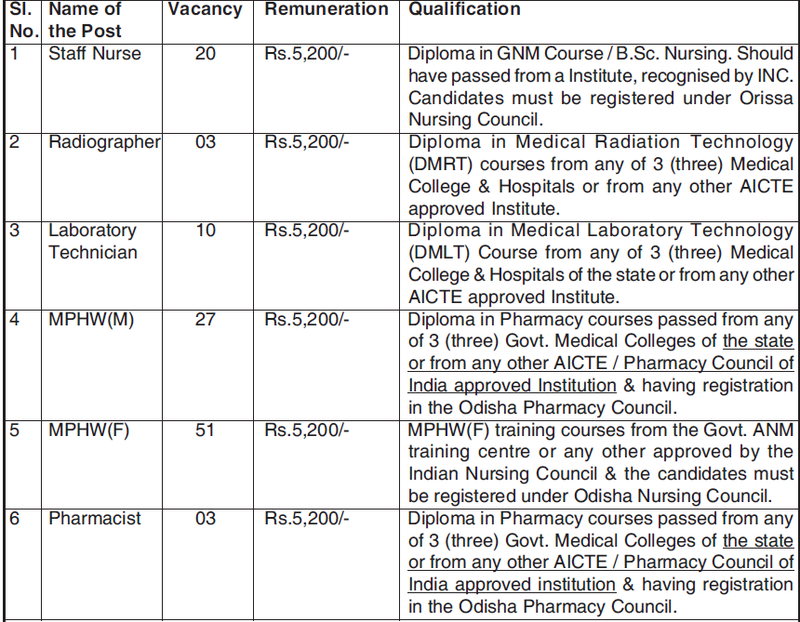 Applications in the prescribed proforma are invited from eligible candidates for following Staff Nurse, Radographer, Laboratory Technician, MPHW & Pharmacist posts under the Chief District Medical Officer, Jagatsinghpur District to be filled on contractual basis with monthly remuneration mentioned against each of the post. Age Limit: The candidates must not be below the age of 21 years or above 32 years as on 1.6.2013. The upper age limit shall be relaxed by 5 years in case of SC & ST & SEBC candidates, and 10 years in case of physical handicapped / Ex-Serviceman candidates. Age relaxation is however applicable in respect of one category only. The ORV Act and Rule will be applicable for these contractual recruitment as per existing guidelines. Note: The appointment is purely temporary and may be terminated at any time without assigning any reason thereof. Selection will be made on merit basis as per marks obtained in the examination of required qualification. No additional weightage will be given for higher qualification. Candidates, who are already working in Health Department either on regular or contractual basis, have to apply through proper channel. Application form and details can be downloaded from the district website i.e. www.jagatsinghpur.nic.in / interested candidates fulfilling the eligibility criteria mentioned above are to apply in prescribed application format to the undersigned by Registered Post / Speed Post / Courier on or before 15.07.2013.The last date of receipt of the forms by Regd/Speed post/Courier only is on or before 15.7.2013, “Application for the post_______” should be written in the top of the envelope & send to to the Chief Dist. Medical Officer, Jagatsinghpur. Incomplete application or application received after due date shall be rejected. Authority shall not be held responsible for the postal delay.